“U” stamped and registered with the National Board of Pressure Vessel Inspectors. Elbi of America, Inc. is your comprehensive source for custom fabricated ASME code pressure vessels in a variety of steel and alloy materials. We design and manufacture custom steel tanks for a wide range of application needs. Whether the application involves high or low temperature or pressure ratings, or requires special paint or linings, our custom steel tanks can be ordered and fabricated to your precise specifications. 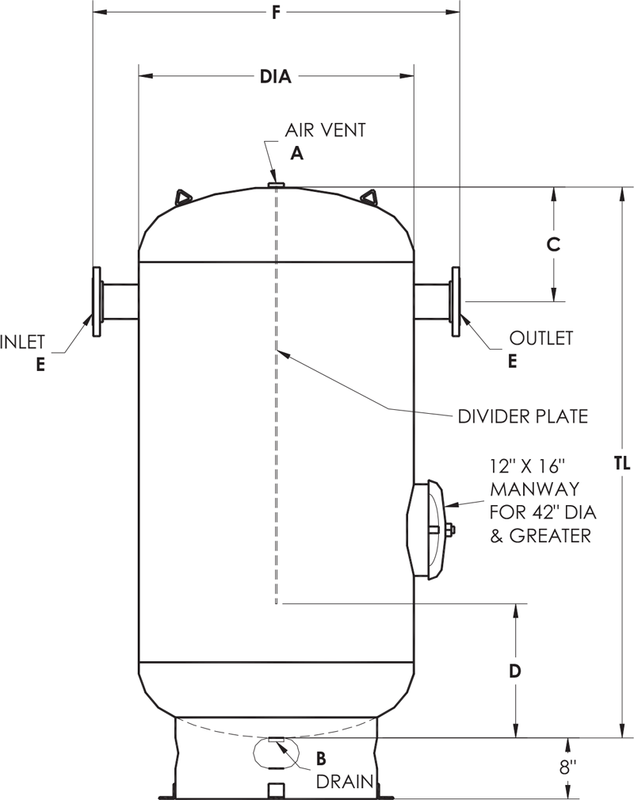 Our capabilities includes the design of custom pressure vessels to meet a wide range of requirements, including air separators and bladder tanks. Please contact us with your tank requirements. Vertical Epoxy Lined Water Storage Tanks for Potable Water Storage. Built to ASME Code Section VIII, U-Stamped National Board Certification. Features: 2″ Non-CFC foam insulation. Glass lined steel tank—Elbi’s Ultonium™ lining is applied to the interior surface of the steel providing a tough wear resistant lining which minimizes the effects of high temperature hot water. Factory installed dielectric fittings—no dielectric fittings or unions needed. Side T&P valve opening. Two magnesium anode rods—for more even distribution of corrosion protection and longer service life. Hand hole cleanout—for removal of accumulated lime and sediment deposits. Brass drain valve. Five year limited warranty on steel tank—heavy gauge steel automatically formed, rolled and welded to assure a continuous seam for glass lining. Each tank is triple tested to insure quality. One year limited warranty on parts. Designed for flashing of high pressure condensate into steam and low pressure heating supply mains. Flash tanks also reduce steam pressure prior to returning to either condensate tanks, boilers or discharge into the sewer mains. By-Pass Feeders are a convenient method of introducing treatment chemicals into closed circulating water systems. By-Pass Feeders are ideal for use in hot water treatment in heating systems or chill water air conditioning systems. Industrial gray enamel finish paint.